These Competition Guidelines describe the objectives and requirements governing the Adult Literacy XPRIZE Communities Competition. This document constitutes a legally binding agreement between Competitors and XPRIZE. Competitors also acknowledge and agree that the Application Forms, FAQ, Overview section of the website, and other documents published by XPRIZE govern the competition and are legally binding. Nearly 36 million adults in the U.S. lack basic literacy, yet only approximately 5% have access to educational services. The goal of the $1 million Adult Literacy XPRIZE Communities Competition is to expand access to adult education technology tools. Our mission is to empower millions of adult learners to acquire the skills they need to advance their education, find better work, or simply read a bedtime story to their children. Stage 1 teams’ apps that have produced measurable and significant learning gains in the field test will qualify for distribution in the Communities Competition. 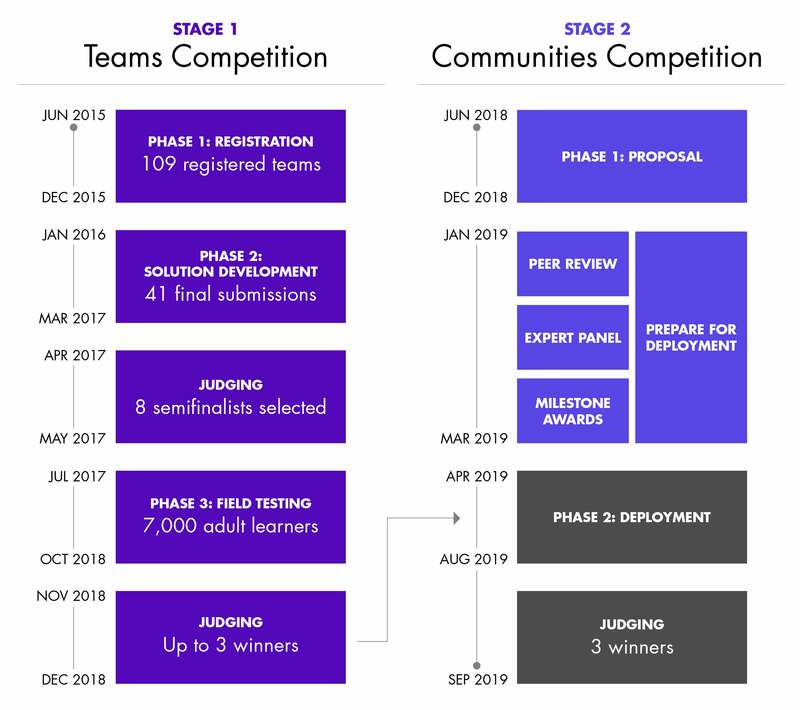 If none of the competing Teams in Stage 1 qualify, XPRIZE may opt to cancel Phase 2 of the Communities Competition and to distribute prize winnings for Phase 1 only (see §1.3). Figure 1 details the Phases of the two Stages of the Adult Literacy XPRIZE, the Teams Competition and the Communities Competition. A total of $1 million in cash prizes will be awarded in two Phases of the Communities Competition. In Phase 1, the “Proposal Phase,” up to 50 competitors will win an equal share of a $500K milestone award by demonstrating how they will use technology to increase access to education for adults. These proposals will be judged for their impact, innovation, feasibility, scalability, and durability. A detailed scoring rubric may be viewed here. Winners must use the Prize winnings to benefit adult learners. The Application Form will require teams to explain how they intend to spend the winnings. In Phase 2, the “Deployment Phase,” competitors in three tiers will win a share of an additional $500,000 for recruiting participants to download and use the qualified apps from Stage 1 (Teams Competition). All competitors who meet the application deadline are eligible to compete in Phase 2, regardless of whether or not they were among Phase 1 milestone award recipients. Upon registration, competitors must elect to compete in one of the three tiers. The deadline for switching to a lower tier is March 31, 2019. There is no deadline for switching to a higher tier. To qualify for the prize purse in a tier, competitors must attain a minimum threshold of participant downloads as detailed in Table 1. The winners in tiers 1 and 2 will be the entities that have attained the minimum threshold of participant downloads for the their tier and which have the largest number of participants use the app on at least three separate days. The winner in Tier 3 will be the entity with the largest number of participants who use the app on at least three separate days without need to meet a minimum threshold. Teams must also demonstrate how they intend to continue to support increasing access to adult education beyond the competition. A judging panel will determine competitors’ compliance with these goals. For further detail, see §2, Competition Structure. Winners must use the Prize winnings to benefit adult learners. The Application Form will require teams to explain how they intend to spend the winnings. XPRIZE believes that solutions to humanity’s greatest challenges can come from anyone. The Communities Competition is open to any educational institution, non-profit, NGO, government agency, company, corporation, individual, person, or any other legal entity duly constituted in the United States ONLY, regardless of size, locality, and whether or not the competitors have previously worked with or served adult learners. Communities can be virtual, local, regional or national in scope and reach. Competing communities may recruit participants anywhere in the United States regardless of that community’s physical location. Only participating learners recruited within the United States will be counted in the competition’s tally of users. XPRIZE reserves the right to limit, or restrict upon notice, participation in the competition to any person or entity at any time for any reason. Organizations, individuals or other entities deemed to promote hate, hateful speech, discriminatory policy, violence or illegal activities are barred from competing in the Communities Competition. Competitors will recruit participants to download and use qualified apps. Eligible participants are residents of the United States who have access to a smartphone or tablet running Android OS. Competitors are not required to verify the literacy level of participants. XPRIZE will not test participants to determine their literacy level. Participants can be concurrently enrolled in adult basic or secondary education, CTE or English-as-a-second language courses, but are not required or expected to do so. All competitors must complete all requirements of one phase to be eligible to compete in subsequent phases. Figure 2 details the timeline for these two phases. In Phase 1, which will open on June 23, 2018 and close on December 21, 2018, competitors will submit proposals for the competition using an online form. In their proposals, competitors will detail how they will increase access to adult education for learners using the apps from the Adult Literacy XPRIZE Teams Stage. Proposals will be judged for their potential for impact, innovation, feasibility, scalability and durability. The proposal form will include basic competitor information, explanations of the competitor’s recruitment plans and marketing strategies, a timeline for participant recruitment and an explanation of the competitor’s plans for protecting participating learners and safeguarding their information, if applicable. Competitors will also provide XPRIZE with samples of recruitment materials demonstrating that they have complied with Style Guide and ethics requirements. Competitors will detail how they intend to utilize prize winnings to benefit adult learners in a sustainable way. Competitors will also indicate in which tier they intend to compete. Competitors will be required to demonstrate compliance with all eligibility requirements. Judging of proposals will take place in January and February 2019. Phase 1 milestone prize awardees will be notified in March 2019. During March 2019, all competitors continuing to the Deployment phase will receive additional technical information for distributing the apps to participants. In Phase 2, launching April 1, 2019 and ending August 31, 2019, competitors will actively recruit learners to download and use any of the qualified apps. Figure 3 details the steps competitors must complete in the competition. Judging in Phase 1 comprises two steps. First, all teams will undergo a peer review. In this round of judging, every competing team that submits an application will review and score five other applications against five main criteria: potential for impact, innovation, feasibility, scale and durability. Applicants will receive summaries of feedback provided by their peers. Based on peer review scores, up to 100 competitors’ applications will be reviewed by an expert panel of judges. This judging panel will comprise individuals with a variety of backgrounds relevant to the judging criteria, including marketing, political campaigning, technology, social media, adult education, education technology, policy making, and other areas of expertise. As in the peer review, these judges will rate each application on a scale of 0 to 5 for impact, innovation, feasibility, scalability and durability. The scoring rubric may be viewed here. IMPACT: Is the proposed approach likely to increase access to both adult basic education and ESL for a sizable portion of the adult learner population in this community? Does the proposed approach present new opportunities to learners who otherwise would not access educational resources? How does the team propose to expand its current footprint and reach more and more diverse learners? INNOVATION: Is the proposal innovative? Does the proposal offer a compelling vision for the use of technology to increase access to adult basic education and ESL? Does the proposed approach make use of technology to improve both the efficiency and effectiveness of adult education services? Does the team innovate in its approach to marketing, learner outreach, volunteer recruitment, and other means of growing its reach? FEASIBILITY: Has the team demonstrated the skills, capabilities, and past achievements to deliver the proposed solution successfully? Has the team set audacious yet achievable goals considering its resources, community size, and experience? Does the project plan demonstrate a realistic understanding of the tasks and costs to implement the proposed solution? Has the team demonstrated how it will measure its own success? SCALABILITY: Could this approach be effective at scale? Will the approach scale efficiently and cost-effectively? Is it replicable in other contexts, circumstances, and communities? Could it become a model for other communities and organizations? Is the competing team well positioned to help scale this approach? DURABILITY: Does the team propose an enduring solution that will last beyond the timeline of the Communities Competition? Does the proposal offer a plan to continue to support the proposed approach and to incorporate it fully into the competitor’s existing practices and processes? Judges will select up to 50 milestone award winners. All competitors who have submitted their proposals in Phase 1, regardless of whether or not they have won Phase 1, are eligible to compete in Phase 2. To win the tier in which it has registered (for tiers 1 and 2 only), a competitor must produce the minimum threshold of downloads to qualify as a finalist in its tier. The winner in each tier will then be that entity which has the largest number of participants that use the app on at least three separate days. The winner of tier 3 will be the competing team registered in that tier that produces the largest number of participants who use the app on at least three separate days. The Expert Judging Panel shall have sole and absolute discretion to declare the winners of the Competition and award the Prize Purses and other Awards. Decisions of the Judging Panel are binding on XPRIZE, competitors and each Team Member. All parties agree not to dispute any decision or ruling of the Judging Panel. Competitors shall have no right to be informed of other Teams’ calculations, measurements and results, unless such information is made publicly available by XPRIZE. If no competitor meets the criteria for an award, then the Judging Panel will retain sole and absolute discretion to declare or not declare a winner of the Competition and/or otherwise allocate or choose not to allocate one or more of the Awards and/or any other Award associated with the Competition. Beginning in January 2019, all eligible competitors will be provided with a unique code that must be used by learners when downloading the qualified apps. This code can either be embedded in online recruitment materials or translated to other formats for use in print or other materials. When learners download the qualified apps, this unique code will be used to identify which competitor is credited with the recruitment of that participant. Usage is defined as opening and using any one of the qualified apps for any period of time. A learner will be counted as a “user” once that learner has opened and used the qualified apps on at least three separate days. To ensure that the utmost care is taken when recruiting participants, XPRIZE will establish and require competitors in the Communities Competition to abide by appropriate guidelines for recruiting and working with participants. Competitors must sign a form acknowledging their understanding of these guidelines. Competitors who are deemed not to have adhered to these guidelines will be disqualified from the competition and may have legal action pursued against them. Additionally, in their application packets, all competitors in the Communities Competition must provide a detailed plan for how the competing organization will protect participating adult learners from harm that may be caused in the recruiting process. Teams must additionally demonstrate their adherence to these standards during Phase 2. While not all competitors will collect personally identifying information of participating adult learners, those that do must also safeguard that information, either through encryption or offline storage. 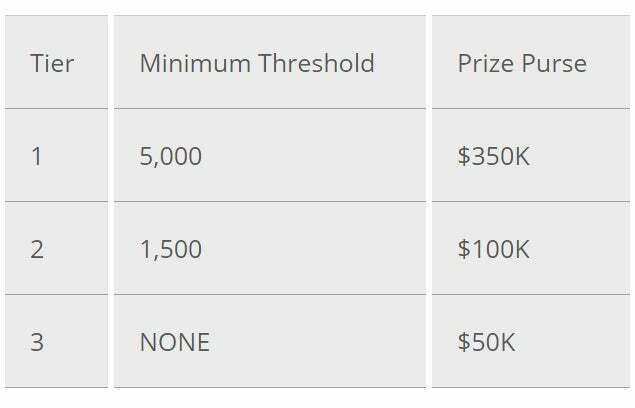 Competitors deemed by XPRIZE or the Judging Panel to have violated these requirements will be eliminated from the Communities Competition. Apps deployed in the Communities Competition will be free to users recruited during the Deployment phase (Phase 2) and for one year following the close of the Deployment phase for those users. Neither competitors in the Communities Competition or teams from the Teams Competition of the Adult Literacy XPRIZE are permitted to charge participants for using these apps during this time period. App developer teams from Stage 1 may, however, offer additional services after the close of the Communities Competition, such as data services to competing communities, and are permitted to show ads in their apps, as long as they do not charge either learners or competing communities for basic use of their apps during this time. No restrictions are otherwise made on Stage 1 Teams. Teams will be responsible for funding all costs associated with competing in the Communities Competition, including but not limited to personnel, marketing, advertising, legal fees, insurance, participant recruitment costs, incentives and other costs. Expenses for tallying results are included as part of the competition and covered by XPRIZE. Teams will have access to a competitor toolkit and other perks that may be made available by XPRIZE or its partners from time to time. XPRIZE will not provide grants or other direct support to competitors. In order to promote innovation in the field of adult education and to increase access to learning tools, XPRIZE retains the right to make public and to share applicants’ Phase 1 and Phase 2 applications, as well as results from both phases, including but not limited to materials, data, costs, number of downloads by competitor organization, usage metrics, results and other pertinent information (the “Materials”). By submitting a Phase 1 and or a Phase 2 application, applicants grant a license to XPRIZE to post on the XPRIZE website and affiliated sites and to otherwise share those Materials.